The work presents the comparison of results obtained with two different methods for filtering LiDAR data, focusing specifically on ground (bare Earth) and vegetation classification. Data was filtered with TerraScan, a leading proprietary software for processing LiDAR point clouds, and with the specific modules available in GRASS GIS. The LiDAR dataset (1.5 points/m2) was produced with an Optech ALTM Gemini and covers an area of the Sardinia region where there are available also orthophotos and false color infrared images, both with resolution of 20 cm. Concerning TerraScan two classifications were computed: the former is a completely automatic and the latter is a semi-automatic one, with a heavy manual reclassification of the previously obtained automatic results. 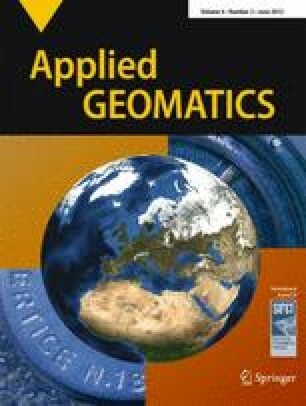 In GRASS GIS the modules developed by the Geomatic Laboratory of the Politecnico di Milano were applied; parameters to be used by the modules were at first calibrated on specific training sub-areas. The purpose of the work is the evaluation of the accuracy in ground and vegetation extraction. Moreover, since GRASS divides points belonging to vegetation in two classes, corresponding to high and low vegetation, the comparison is done for the latter category. The choice of concentrating on this category is motivated by the greater difficulty in distinguishing between terrain and low vegetation. As “ground truth” the result of the supervised classification performed on the orthophotos and the false color infrared images was used. We would like to thank Regione Sardinia for having provided the LiDAR dataset, the orthophoto, and the false color infrared image for the experimentation area. We would like to thank Blom-CGR (Compagnia Generale Ripreseaeree), in particular Simone Ceresini and Andrea Orsi, for having provided the TerraScan results. This research was partially supported by grants of the Italian Ministry for School, University and Scientific Research (MIUR) in the frame of the project MIUR-COFIN 2007 “Free and open source geoservices as interoperable tools for sharing geographic data through the internet”.